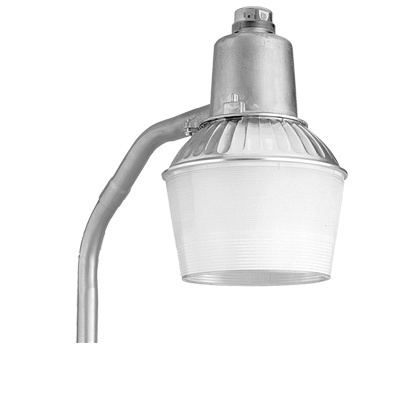 Lithonia Lighting Dusk to dawn security light in gray finish, has rugged die-cast aluminum head. This light uses high pressure sodium lamp that offers 14000-Lumens warm white light. Lamp has color temperature of 2100K and CRI of 21. Lamp has average life of 25000 hours. This light is 24-Inch arm mountable. It includes twist lock photocell control. It has a dimension of 12-Inch x 17-Inch. Dusk to dawn security light is UL listed and CSA/cULus certified.